But Jesus rebuked him, commanding the unclean spirit to be silent and come out of him. The unclean spirit came out of the man, convulsing him and crying with a loud voice. 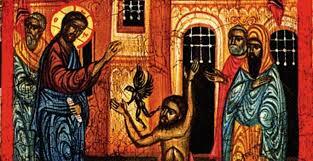 Now, I don’t know about you, but I’ve never witnessed a dramatic exorcism like the ones we read about in the Bible. Talk about evil and demons and unclean spirits sounds strange to us. But when we pay attention to the daily news, it’s hard to deny that evil is pervasive. Many of us long for God to intervene, to bring light and wholeness. Where do you find yourself in the gospel story today? With the people who are ready to be astounded and amazed at what new things God is doing in the world? Or with the people who are comfortable with the status quo…or who are afraid of change and want Jesus to leave the neighborhood? What happens in the Capernaum synagogue develops into the conflict that’s a major theme throughout Mark’s gospel. In the 11th chapter of Mark—and also Matthew 21-- the religious establishment-- the chief priests, the scribes, and the elders come to Jesus after he cleanses the Temple, demand to know: "By what authority are you doing these things? Who gave you this authority to do them?" What we have here is a matter of authority, in Jesus' time and, I believe, in our own time as well. There has always been a danger that we will use the scriptures to confirm what we already think... and that we will hear only what we want to hear. Many Germans once found in the Bible justification for slaughtering millions of Jews or at least justification not to resist the Nazi regime’s actions. Because they wanted to keep their human property, many American Christians once argued from the Bible that it is right to buy and sell human beings as if they were animals. Mean-spirited people tend to find a mean God in the Bible. Comfortable, privileged people usually find that the Bible supports social and political conservatism that won’t interfere with their power and privilege. Poor, exploited people may find that the Bible supports social and political reform or revolution. So, what is to keep us from simply using the Bible to give authority to our own agendas and prejudices? What is to prevent us from using the Bible as a pious excuse for refusing to face the radical claims the living God makes on every area of our lives, here and now? In our Reformed tradition, one of the essential beliefs of our faith is a recognition of the human tendency to make idols and to oppress those who have less power than we do. The positive part of that belief is our belief that we are called by God to work to transform society by seeking justice and living in obedience to the Word of God. This is a time of great turmoil in the world and in Christ's church. During another time of turmoil, Martin Luther and John Calvin and other reformers challenged the religious establishment of their times and brought about the Protestant Reformation. Later, abolitionists challenged the status quo in a church that tolerated or actively supported the institution of slavery. The traditional view of women's role in the church was challenged when we were permitted to be ordained as elders, deacons, and ministers of the word and sacrament. None of these changes were comfortable. Change is hard... and painful. Sometimes it's hard to discern God's will for us, as individuals or as the church, in the midst of complex, divisive issues. People who advocated for the changes were seen as “fanatical"... "immoral"... "subversive"… or heretical. The God we worship is not a tame God. If we aren’t continually astounded and amazed by Jesus’ authority, we may be missing something important. We need to be praying about this. Jesus, filled with the Holy Spirit, came proclaiming the good news of God and saying, “The time is fulfilled, and the kingdom of God has come near. Repent--change-- and believe in the good news. The scribes and others we hear about in the gospel who resisted Jesus and his message weren't bad people. But they didn't know what to do with Jesus when he came proclaiming the good news of the kingdom of God, telling people to repent-- to change-- and trust in the good news. They couldn’t imagine another way of living faithfully in the world. They had a hard time trusting in what Jesus said about how he came to bring us a life of abundance, where everyone can have enough if we all share. So, whenever Jesus challenged the status quo, they questioned his authority. Some wanted him to go away and leave things the way they were. As followers of Jesus Christ, we confess that Jesus is Lord of our life. We're called to trust in Jesus. We're invited to continually be amazed at the truth and grace and freedom we find in his teaching... and his power to even cast out unclean spirits. Over the past 2,000 plus years Christians have continually needed to ask in every new time, place, and situation, “What is the living Lord saying and doing, here and now? What do we need to say and do in order to be faithful and obedient in our time and place?" One of the reasons the church exists is to speak and act consistently with God’s character and purpose—like Jesus did. In today’s lesson about Jesus and the unclean spirit, Jesus doesn’t make compromises with evil. He acts to defeat evil so people can be set free for new life. He sets them free from what possesses them. He heals them of what ails them. Jesus’ authority did not come from military power or wealth or social standing. His authority is from God, who has the ability to deliver and to heal, to convict and to forgive, to cleanse and to raise from the dead. There’s an urgency in Mark’s gospel to recognize that Jesus makes a claim on our lives. Christ calls us to work together, in partnership with him, to confront and overcome the harmful and destructive forces in our lives and in the world around us. As you may know, our Engage Book Group read the Rev. William Barber’s book, The Third Reconstruction, a while ago and were challenged by it. Some of us have gone to hear Rev. Barber speak, and some of us have been praying about how we might be part of the new Poor Peoples Campaign, which will be forty days of action from Mother’s Day to the Summer Solstice. This year marks the 50th anniversary of the Rev. Dr. Martin Luther King’s death and of the Poor People’s Campaign, through which Dr. King was working to unite diverse groups impacted by poverty and injustice. The campaign was carried out that spring and summer after Dr. King’s death. Fifty years later, the work is not done. The four evils that the new Poor Peoples Campaign is taking on are four interlocking issues: systemic racism, poverty, the war economy, and ecological devastation. This national movement is working to bring together interfaith clergy, community leaders, and faith-based and community groups. Can we say we believe in the in-breaking of God’s kingdom in the world if we don’t commit ourselves to bringing it to the people for whom God’s kingdom has been denied- so far-- people who lack basics like safe water to drink, adequate shelter, good education, health care, and a chance to have a place at the table in our society? As the people of God, we are called to share the good news of God’s love with all the people God loves. We’re called to help the world recognize the miracle of grace and abundance that is offered to all people in the life, death and resurrection of Jesus Christ. We don’t have to do it alone. The good news is that in this broken and fearful world, the Spirit gives us courage to pray without ceasing, to witness among all peoples to Christ as Lord and Savior, to unmask idolatries in Church and culture, to hear the voices of peoples long silenced, and to work with others for justice, freedom, and peace. Jonathan Wilson-Hartgrove and William Barber II, The Third Reconstruction: How a Moral Movement Is Overcoming the Politics of Division and Fear (Beacon Press, 2016). “A Brief Statement of Faith” of the Presbyterian Church (U.S.A.), 1990.